Moving furniture from UK to Spain sounds like a simple thing to organise � and for the most part it is. However, when you start to look around at your home and realise just how much you have there to be packed, it can start to feel like there is a lot to do. Many people will feel a little overwhelmed when the reality of their removals to Spain draws near. 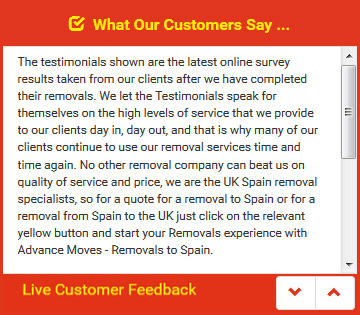 If you can bear in mind a few things that will help you when your removals company arrives to start moving furniture to Spain it will make things go a lot more smoothly. One thing to remember is that most removals companies will not be able to enter your loft space to empty it unless there is a fixed staircase and boarded floor. This is because their insurance company won�t cover them to do so, and therefore you will need to empty the loft beforehand. Removals companies which are taking your furniture will be able to take your house plants as well, although many people prefer to transport these themselves, as they can so easily be damaged. It is important to remember that although most plants can be taken into Spain, rhododendrons, some orchids, and anything in the acer family (including maples) are prohibited. Removals companies usually cannot transport any flammable materials including paint and fuel. If you have anything that needs to be moved to Spain that uses fuel, it must be emptied before transit. Alcohol and tobacco are also prohibited by the Spanish authorities. Advance Moves are experts in moving furniture from UK to Spain, and are your best option for this important job. Contact us on 0871 218 0612 or email info@advancemoves.com to get a detailed quote and to ask questions. Quick quotes to inform your budgeting can be found on our website at http://www.advancemoves.com/.